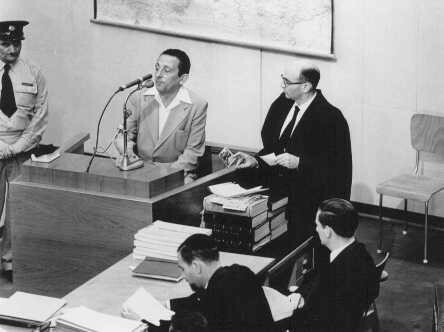 Henryk Ross testifies during Adolf Eichmann's trial. In addition to official duties as a photographer in the Department of Statistics in the Lodz ghetto, Ross secretly photographed scenes in the ghetto. To Ross' right is chief prosecutor Gideon Hausner, who holds some of Ross' photographs submitted as evidence. Jerusalem, Israel, May 2, 1961.